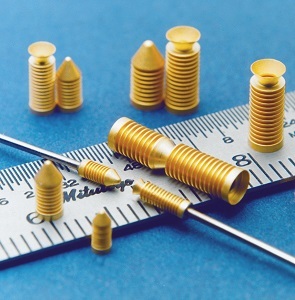 Servometer manufactures paired miniature gold plated bellows contact springs for flexible interconnection. Bellows technology in electrical contacts reduces the signal loss and increases the speed in which the signal is transmitted. Rather than traveling along the path of a spring, the signal travels the walls of the bellows to get the maximum signal in the least amount of time. Our Interconnectric® product line of electrical contacts is available in both male and female configurations for applications that require two parts to be paired together. The conical shape of the tip of the male gold contact creates self alignment with the concave conical shape of the female receptacle. Other applications will have the contact make an electrical connection with a pin or feedthrough hole. 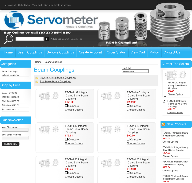 Outside diameters range from 0.37 to .125 inch (0.94 to 3.18 mm). Overall lengths range from .111 to .271 inch (2.82 to 6.90 mm). Manufactured from electrodeposited nickel and gold-plated to ASTM B488 to enhance their conductivity, the contact springs are designed to provide lifetime spring and force repeatability. These self aligning contacts will minimize shock and vibration in dynamic applications; help overcome tolerance buildup and misalignment problems in critical assemblies, and allow the designer a less expensive alternative to high cost, tight tolerance assembly components. Paired contacts will self align as they connect to compensate for angular and parallel misalignments.